Tomorrow I’ll be sharing an Owl Themed Baby Shower I helped plan for my friend Krista. Today I’m going to share with you the gift I put together for her. This idea is not new, but I chose a bunch of products that I personally HAD to have as a new mom. Let’s run through the list, shall we? Temporal Artery Thermometer – If you don’t have one, you need to get one. I recommend the Exergen brand. Ours came from Costco and is by far the best one I’ve owned, and it only costs $30! No need to wake a sick child to take their temp, non-invasive and easy to use. 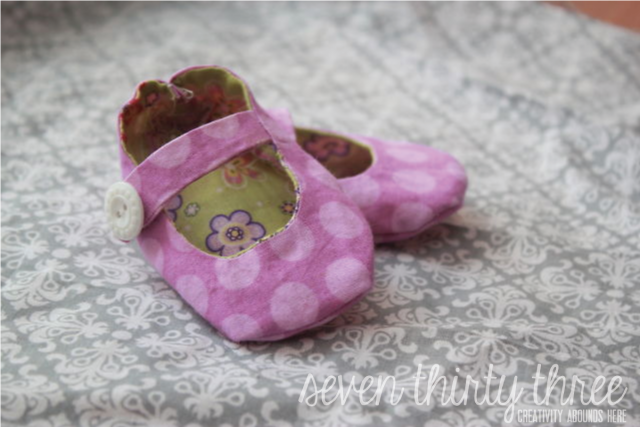 Blanket Sleeper – My babies were constantly unswaddling themselves during the night. I was always waking up to check on them because we live in Vermont and it gets cold. My mom bought me a zippered blanket sleeper and I was instantly hooked and bought 4 more. I put my kiddos in their onesies and then put on their blanket sleepers and we both slept better. They were warm and I wasn’t concerned that they would be cold. Hand Sanitizer – I had young siblings and nieces and nephews and other family members that were constantly wanting to touch my babies, so an easy to carry hand sanitizer made it a breeze to keep the germs off my little ones. I created a “sanitize before snuggles” label and slapped it on some travel size bottles. Nursing Cover – I have made these in the past, but I wasn’t able to find the time before the baby shower, so I purchased one for $16 from Amazon. Although I do know this company is usually in Parent Magazine with a coupon to receive one for free. This is another item I personally used on a regular basis. They’ve come a long way in the 5.5 years since I had my son. Mine was a solid black one and it was THE only one I could find locally. Now they are stocked all over the place! Baby Sleeping Door Sign – I created a door sign that says “Shhhh… Baby sleeping” and have made it available for download. There are two versions, the second one includes “Please knock” for those with door bells. Breast Feeding Kit – I didn’t have this kit when my son was born, but I wish I had. My milk took THREE days to come in, by that time both my son and I were frustrated and I was SORE. The Soothie gel pads the hospital gave me were a god-send. This kit has something similar that can be cooled or warmed, as well as several pads, a bra clip, a feeding schedule book and a carry case. I purchased this Aveda kit from Amazon for $10. Reeses Peanut Butter Cups – Just because! A little sugar for your sweet tooth is always appreciated. Water Bottle – As a breast feeding mom you need to steadily drink to keep your fluids up, so giving the new mom a cute water bottle is perfect to help her do so. 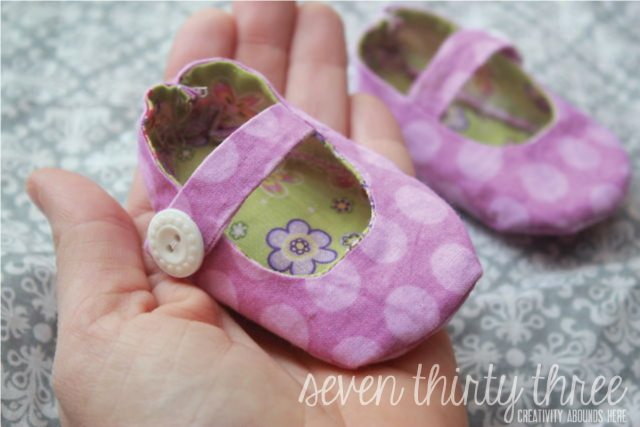 These were another just because gift… I wanted to do something special and since Everleigh is going to be a May baby we need to keep her tootsies warm! 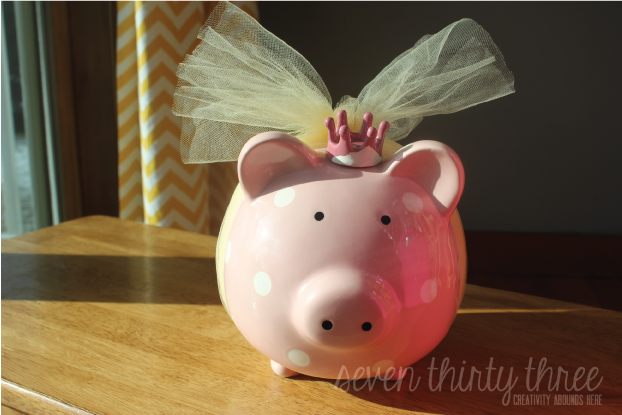 Lastly I picked up this sweet Piggy Bank on clearance at Homegoods. My daughter wanted to put in a few coins so she very sweetly took a handful from her own piggy bank to share with Everleigh. This will help the new parents start the college savings! I whipped up a Survival Kit label, and stuck that to the plastic tub I picked up at Dollar Tree. 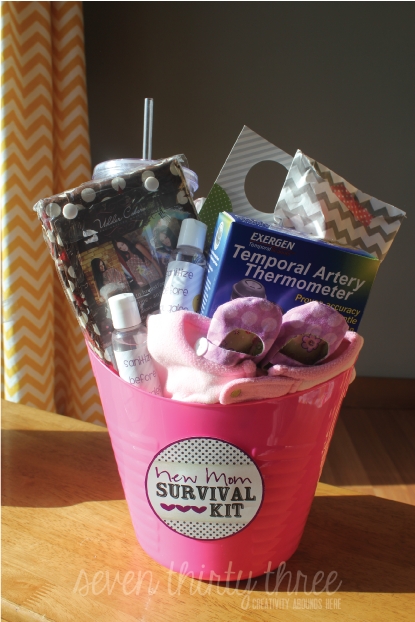 Perfect gift for the soon-to-be new mom! Would you have added anything differently? What are your must haves? I love this. I’m always trying to remember the things I loved as a new mom, but this list is awesome!